The corner of Prospect and Rose in Hayward. HAYWARD | Like many East Bay cities, Hayward has many streets and sidewalks in need of repair. However, Hayward’s city government found the one road improvement project that it may have thought twice about fixing. Last month, Hayward city employees inadvertently repaired what they understood was a broken sidewalk curb on the corner of Prospect and Rose. 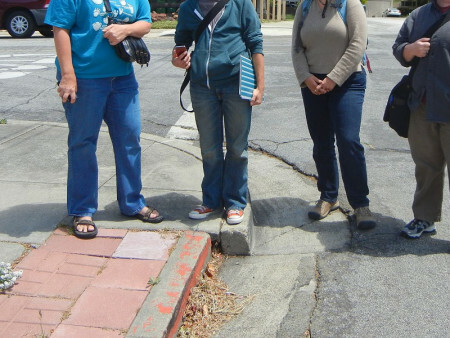 In fact, the disjointed curb was a scientific curiosity long studied by seismologists studying the nearby Hayward Fault. Why Hayward city government might have been clueless about the significance of the curbside could be attributed to the exodus of city employees since the Great Recession. In addition, labor relations with the city have soured in recent years beginning with a stunning wage imposition on 300 of its city workers, including those who may have participated in repairing the corner of Prospect and Rose at the direction of the City Council. In the meantime, we’re all going to die. Posted in city employees, geology, Hayward, Hayward Fault, imposition, recession, roads, seismic activity. Bookmark the permalink. Typical for a city that is so poorly managed and policed. I dont believe for one second that the Hayward public works staff person did NOT know what that mini-site represented. Not one second. They knew — it's the cover-up that's making things worse. I encourage you to dig deeper. Why else did Hayward trot out the Deputy City manager in front of the TV cameras? There's the PW head honcho, then the sub head honcho, then another head honcho, then the PW worker bee who actually tore it up. The top and mid-level guys KNEW what that micro-site was. But, like purposeful and spiteful &&&&, they PURPOSEFULLY did that. Dig more and ask about the chain of command that led to the PW worker-bee tearing up that site. Someone is lying — there is NO way that in the PW chain of command that led to this, there is NO way that there was not one person who did not know about this site — then, to make matters worse, to have the executive staff then cover this up even more. Keep digging! They couldn't trot out Fran because she's one the rats abandoning ship. The cause of the problems and the root of all evil. In fact, she's the Queen Rat who is leaving with a big payout. Council is clueless, crony executive staff and idiotic management are the legacy that Fran leves behind. The frontline workers do what they are told. Too many Directors, Administrators, Supervisors and Pillow Pouffers giving direction. There are the people who run the city and the people who work for the city. Maybe the city should have marked the spot with one of those witty signs like “Don't fix me dummy, I'm not broke!” Neither is the city, who is spending 90 million dollars on street repaving. The equivalent of another fancy library and tree plaza on paper, not actual cost upon completion. Or even down payment on a fancy new Police Station. I bet Greg Jones tripped on the curb and Anna May told him to request the repair. Greg isn't through wrecking the city of Hayward.